Is it possible to connect to Internet without changing existing softwares? 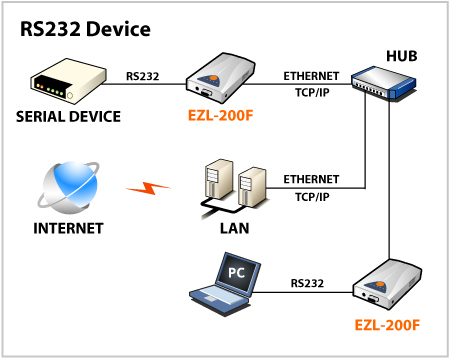 If you communicate with existing serial device through RS232/RS422/RS485, you can do it. But, it could be slight alterability in accordance with your system's organization including ezTCP. Please, refer to the next writing. The ezVSP supplied free of charge by Sollae Systems is alternative to ezTCP on PC side. * Refers to the next writing for more information of ezVSP. Here is one of the best ways to apply ezTCP. then the user don't need ezVSP or the ezTCP on PC side any more. the software which support TCP/IP protocol for 1:N communication like above image. * Here are two of the ways. In this case like above, ezTCP should operate Client(COD) mode(if TCP use) or UDP(U2S) mode(if UDP use). Of course, the software on PC is replaced with suitable one. FAQ No. 75 I would like to send data to multiple systems simultaneously(1:N communication by UDP broadcast). FAQ No.173 What is a multi monitoring function(1:N communication by TCP)?